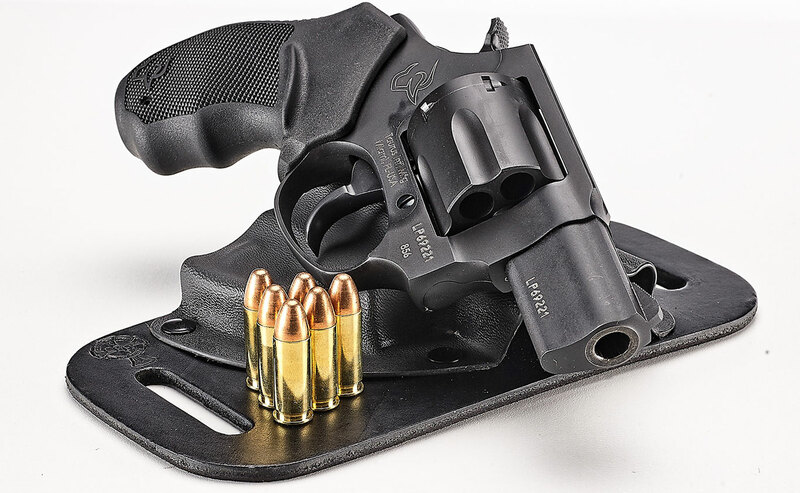 If you're in the market for a small, concealable, self-defense arm that's as easy on recoil as it is the bank account, it may be time to take a walk on the cylinder side of things and explore the Taurus UL 856 revolver. Yes, a revolver. In a world saturated with compact semiautomatic pistols, the revolver hasn't been getting the love of many first-time shooters and concealed-carry card holders as it used to. But the .38 caliber that was popular at the turn of the 20th century can still be a viable option for folks looking for operational simplicity and dependability with enough persuasion to stop a threat. Also, don't think the .38 Special chambering is a detriment. Ammunition today is top notch with loads featuring a wide choice of bullet weights ranging from Hornady's 90-grain Critical Defense loads up to 158-grain round-nose thumpers in Remington's Performance Wheel Gun offering. There are also training loads from Winchester to hone your skills. Sure, velocities don't match the 9mms, but even at the velocities I was recording from the Taurus â€“ an average of 923 feet per second (fps) for the 90-grain Hornadys and 722 fps for heavier Remington 158s â€“ they're moving plenty fast. Couple that with the attention to bullet design the ammo gurus are giving them, penetration and expansion isn't a problem at the ranges a snubby would best be utilized. Engaging targets at that distance with the gun's long double-action (DA) pull proved a bit more challenging given the gun's serrated front sight and grooved top strap acting as the rear sight. At 15 yards, the extreme of what some defense experts claim as the effective range for any defense gun, the 856 proved it had accuracy potential tallying an average of 2.97 inches in single-action (SA) using SIG Sauer's V-Crown 125-grain JHPs. Keep in mind that was from a sandbag rest and the hammer cocked back, which turned the trigger into a buttery-smooth â€“ and crisp â€“ 4 pounder. A far cry from the 10-pound, double-action pull. Engaging targets at that distance with the gun's long double-action (DA) pull proved a bit more challenging given the gun's serrated front sight and grooved top strap acting as the rear sight. But with a little white out on the front sight and on top of the lands at the rear of the groove, I was able to group six shots with a variety of ammo inside plate-sized targets at 7 yards after some practice adjusting to the DA trigger. Not unlike the 856's semiauto competitors, the grip on the revolver is on the small side. Even with my small hands, I found my pinkie folded under the grip. But this turned out not to be an issue. Taurus compensates for the size of its grip by providing a nicely textured soft rubber grip with finger swells. This provided ample gripping confidence during off-hand drills with my pinkie finger turned into a stabilizer nuzzled up to the soft bottom of the grip. Firing the gun from a variety of two-hand stances and then one handed, the gun will get the job done hitting torso-sized targets close in. Carrying the 22-ounce, all-steel gun in both a Freedom inside-the-waistband (IWB) holster and in an outside-the-waistband (OWB) Snapslide holster from CrossBreed for a number of days didn't feel much different than carrying a compact semiauto. The gun's curved grip and the holsters' designs that hugged the body helped prevent printing below an untucked shirt or jacket. While there's no arguing the 856's six-shot capacity is less than many compact 9mms (although a few only carry seven shots), I believe the 856 could compensate for the lack of firepower with better accuracy thanks to technology. Adding a laser grip such as Crimson Trace's LG-385 would significantly improve the on-target effectiveness of the gun at ranges out to 15 or 20 yards and make the gun easier to shoot well in reduced-light conditions. If I was to have one in a night stand, I'd definitely want a laser grip on the gun. If I was to have one in a night stand, I'd definitely want a laser grip on the gun. Its iron sights are hard enough to aim during the day, and at night they would be useless. A laser would give aim and shoot capability. With a manufacturer's suggested retail price of $329, I do believe one could cross the counter at a dealer for under $300. Definitely an affordable personal protection option worth considering.